Although photography had been commercially available since 1839, it was an expensive process. Therefore, newspapers, magazines, billboards, and posters were produced using illustrations rather than pictures well in to the 1930s and 1940s. Some of the more famous illustrators include Charles Dana Gibson, Norman Rockwell, and Beatrix Potter. Artists who were well-known at the time, but have fallen into obscurity are J.C. Leyendecker, Sarah Stilwell Weber, Edmund Franklin Ward, and Alfred Staehle. Born in Munich, Bavaria in 1899, Alfred Staehle came to America with his parents in 1914. His father and maternal grandfather were both artists, so Alfred came by his talent naturally. In an effort to improve his skills, he attended The Wicker School in Detroit and the Arts Student League in New York. 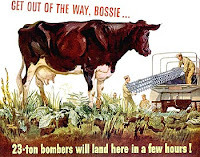 He found early success after entering a poster contest for Borden milk and was soon providing advertising and cover art for magazines such as The Saturday Evening Post, American Weekly, Jack & Jill, and Good Housekeeping. He also created posters, and one of the most prized posters of the 1939 World’s Fair is his. A large portion of his work featured animals, and he was considered by many to be an animal expert. 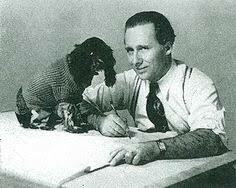 Often using live animals as models, it is said that Staehle surrounded himself with creatures while working in his studio. He also painted from pictures, and he eventually married one of the photographers he hired to photograph his models. Staehle was also successful with his billboard work, and in 1938 he was awarded the Kerwin H. Fulton medal for Achievement of Art in Outdoor Advertising. 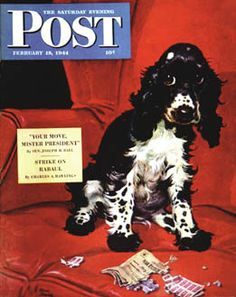 But he became a household name with the February 19, 1944 issue of The Saturday Evening Post when he drew a cover that featured a Cocker Spaniel named Butch chewing up ration coupons. The magazine seemed to sellout overnight, and letters poured into the Post’s offices defending the puppy. A few readers also sent replacement coupons. Butch was incredibly popular, and he was featured in twenty-five Post covers and thirty American Weekly covers, often getting into trouble for chewing something, “borrowing” an item that didn’t belong to him, or getting into some sort of predicament. Staehle purchased his very own “Butch” in June 1944. 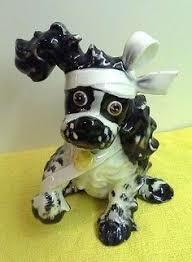 Butch was so popular, Hagen-Renaker Potteries of California created figurines of him, Atlas Toys produced a stuffed version of him, and Saalfield produced a coloring book and jigsaw puzzles. Butch also made personal appearances to help raise money for worthy causes, and after the war he appeared on a Navy re-enlistment poster resulting in his being sworn in as the official Navy mascot. Not bad for a small, mischievous puppy. Wartime Wednesday: Who was the Mystery Chef?